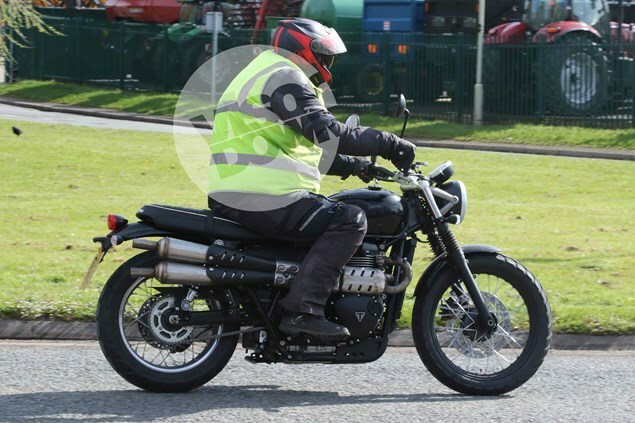 SPY snappers have caught Triumph’s latest prototype on the road and their pictures show that the firm is working on a next-generation Scrambler based on the new Street Twin. Given the popularity of scrambler-style machines at the moment and the fact that the old air-cooled Triumph Scrambler lacks the ABS and Euro4 emissions certification it would need to remain on sale next year, it’s no surprise that the Hinckley firm is keen to prioritise the new model. The prototype in these pictures is clearly nowhere near the finished bike, but it does feature the key elements that will appear on the new Scrambler. The engine, chassis and most of the bodywork come from the Street Twin, but there’s the trademark high-level exhaust to mark it out as a scrambler, along with wire wheels and knobbly tyres instead of the Street Twin’s usual alloys. Although Triumph already sells a Scrambler Inspiration Kit for the Street Twin, it’s quite different to this prototype. The Inspiration Kit’s Vance and Hines pipe might also be a high-level one on the right hand side, but it’s got just one silencer and no catalytic converter. As such, it’s sold for ‘off-road use.’ This bike has a clearly-visible catalytic converter near the front of the exhaust, and twin end-cans to help meet road noise limits. The Inspiration Kit also does without wire wheels, and features a thin, flat seat that removes the rear fender. This prototype retains the Street Twin rear mudguard – probably only temporarily while a Scrambler-specific one is developed – and seems to be using the seat from a Bonneville T120. The bars are repositioned slightly, with new risers, and there’s a bash plate under the front of the engine. Its real job isn’t protecting the frame from rocks, though, since few riders would ever take a retro scrambler like this off road. Instead it’s needed to cover the empty space where the catalytic converter would reside on the stock Bonneville and Street Twin. The engine is the same 900cc version of Triumph’s new water-cooled twin that’s used in the Street Twin. That means it’s making 55hp at 5,900rpm and 59lbft at 3,230rpm. Power-wise, that’s actually a fraction less than the existing Scrambler (59hp at 6,800rpm) but the torque is much greater than the older bike’s 50.1lbft and peaks 1,500rpm lower, so it’s likely to feel significantly punchier.